I stopped by Rivertown earlier today to grab a pint of the Winter Ale (review here) while I was there I got my growler filled with their Roebling Imperial Porter off of the nitro tap. I did this because I’ve had a few Roeblings over the year and never given them a full review but also as part of the winter of my of dark content. I also scored 2 bottles of Gueuze, but more on that another day. There are a number of bridges crossing the Ohio river in Cincinnati (or Covington/Newport if you wanna be a Kentuckian about it), one of which is a big yellow arch (the big mac), another purple one for people (cleverly named the purple people bridge), and another old fashioned looking one with 2 big towers and suspension cables. That last one is the John A. Roebling suspension bridge. Most notable for being the precursor to the Brooklyn bridge it’s also the oldest bridge in Cinci, and is a damn fine piece of construction that has been carrying traffic for almost 140 years! Ok.. honestly I never new any of that before having 2 pints of this beer and doing some Googling, it’s a pretty cool story and I suggest everyone check it out knowing being half the battle and all that. But you’re not here for history, so on to the beer! Not sure why there is no head here, could be the nitro tap to the growler. The 75% nitro could result in the beer being flat after a day or two and may have caused the head to be non-existent tonight. Usually there is a thick, dark-tan head that hangs out for a long time. Nitro or not it comes out a super duper black color and appears to be clear, but it’s hard to tell due to the darkness. The aroma is full of roasted malt and chocolate. As it warms those become more prevalent and some vanilla kicks in as well. The taste packs all kinds of chocolate, espresso, vanilla, and roasted malt flavors as well as all sorts of extra craziness. Strangely (at least for a relative hop head like me) is the lack of hop flavors or bitterness, instead there are some bitter malts. It’s a complex and interesting taste. Not my favorite taste in the world, I’m not a big chocolate/coffee guy, but it’s still damn good. The flavors shift a bit as it warms, the espresso and coffee action moves to the forefront along with the vanilla while the chocolate, roasted malt, and malt bitterness slide back a bit. Heavy body with a bit of slickness going on. 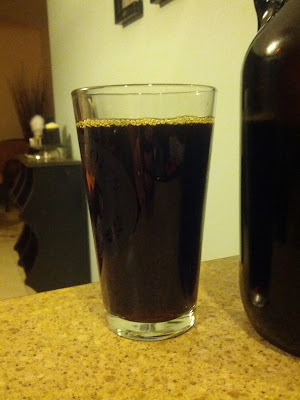 Only slight carbonation, could be from the nitro again. No real flavor or sensation of the alcohol, but oh boy is it there. After a pint of this it really doesn’t feel like a 7.8% beer, I don’t know what kind of magic is at play but it feels like I’ve had a pint of something closer to 9%. This has been in my growler for less than 5 hours and I can already tell how the nitro tap has affected it. Turns out that in a pint a nitro tap is a great idea, it gives you a smooth and creamy beer. In a growler… the nitro mixes with the beer creating a quasi-flat, headless, slightly uncarbonated beer. I expected this after a day or two, but not after 5 hours c’est la vie. Don’t let my growler experience deter you from trying this beer, it is delicious and should be enjoyed by all, especially in a pint on nitro tap at the Rivertown Tap Room. Rivertown actually brewed this for a festival that is put on to celebrate the history of the bridge…http://www.urbancincy.com/2011/06/roeblingfest-expands-to-include-focus-on-food-music/. I am surprised this is a nitro tap as I have never seen head from the bottle or tap with this porter. One of my favorite porters out there though, strong, but not overpowering.